When I first came across Renard's Dash-Da-Dash DX earlier this year (courtesy of a news post on indiegames.com), my first thoughts were far from positive. 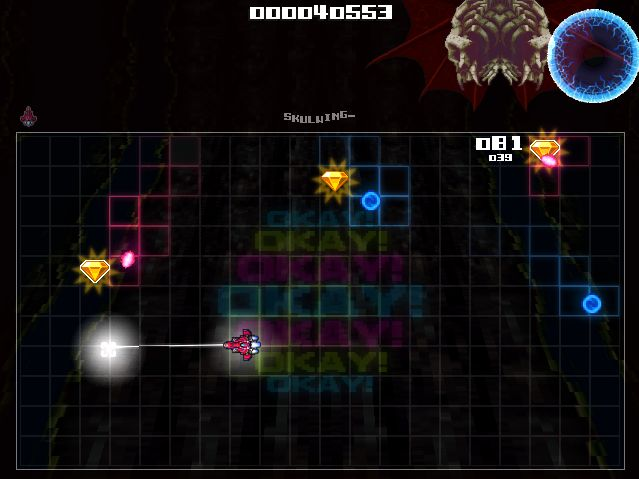 Seeing a couple of screenshots of the game full of obviously ripped sprites and a soundtrack that sampled whole tracks by just about every underground electronic act worth mentioning from the past decade, I initially mistook it for another of those hideous no-effort montages from a coder who obviously was too lazy to create or source their own original material. Focusing on the presentation (I'll discuss the actual game itself in a bit), Renard is one of the pioneers of a new style or genre in the indie gaming community - something that will be familiar to anyone who (like me) DJ's or makes beats; a white label mash-up. Utilising graphic content from a massive range of popular games (including Contra 4, Do Don Pachi, Megaman, Castlevania, Sonic, Metroid and Metal Slug) and sound effects similarly stolen from Smash TV and Sinistar, Renard has cut and pasted them into a wholly original arcade experience that is equal, if not greater than the sum of it's parts. Unlike the popular mash-up from yesteryear RomCheckFail, instead of recycling the assets in a predictable fashion Dash-Da-Dash DX controversially remixes the elements in a completely unexpected way, resulting in bosses that use parts of enemies from a wide range of sources and visual effects that haven't been seen since the early LSD-fuelled digital experiments of Jeff Minter. 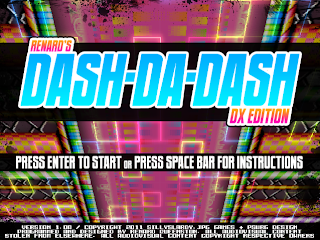 The issue I was initially most sore about was the music; but after loading the game for the first time I realised that really Dash-Da-Dash should be considered more of a promo mixtape than mere petty theft or piracy (in fact, the game's website even features a downloadable 11-track mini-mix of heavyweight beats and bass, featuring tracks from Krafty Kuts, DC Breaks, Pendulum and Exile amongst others from the game). Ok, so enough about the cosmetics; we all know that great graphics and audio do not make a great game alone - there's the design and execution to consider as well. Annoyingly, Renard seems to be one of those people who can pull off all areas of game creation single-handedly. 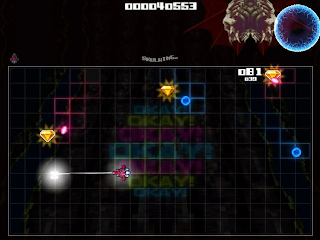 The game's concept proves to be maddeningly addictive - described in simple terms, there is a boss-type enemy at the top of the screen who spews waves of bullets across the game arena. Your ship sits in the centre of the screen and moves to the position of your mouse pointer via a single click (in a straight line). There are bonus gems to collect that warp randomly into the battleground, and your goal is to survive as long as possible while grabbing all the points you can. The boss attacks become increasingly violent as time passes, and before you know it you're dead and frantically hitting the start button to begin another futile attempt. Written out like that it actually sounds a bit too basic, doesn't it? This is where the flawless execution comes in; Renard has taken a design that could have resulted in just another one of those disposable web-browser time-killers and polished, tweaked and force-fed it hallucinogenic steroids until it mutated into a coin-op worthy future-classic. Believe the hype - DDDDX kicks like a mule. On a final note, the next game in progress from Renard and his Sillyslardy.jpg label, 'Harpy! Siren!' looks even more exciting; there's a promo video of the game in action hidden away on his web site to tingle your tastebuds - so check it (click on the record label)!